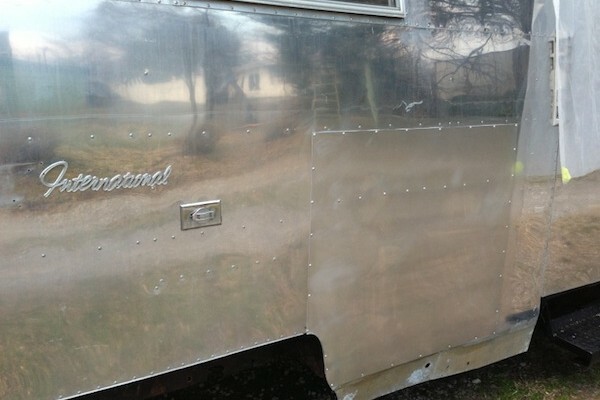 When we first brought our big shiny trailer home, she still had a lot of her original systems that no longer worked and needed replacement – primarily the old water heater and furnace that each seemingly weighed a ton. Our new water heater and furnace will be contained in a single, space-saving unit: the innovative and energy-saving TwinTemp Jr. tankless water heater and hydronic heating system made by PrecisionTemp, right here in the USA. 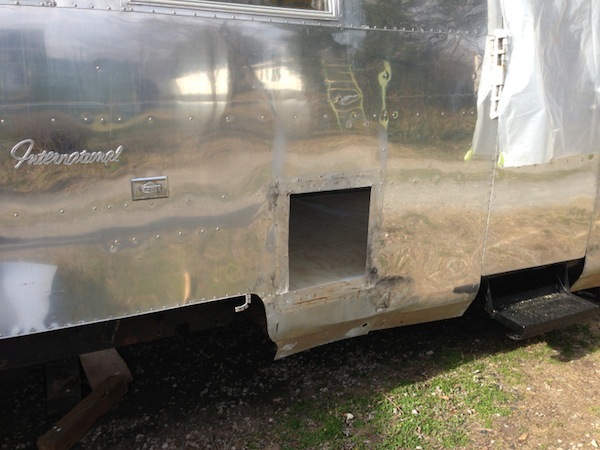 Because this new unit takes up about half the space the old furnace and water heater did, replaces two devices with one, and vents through the floor of our Airstream, we had two gigantic access holes/vents in the trailer walls that we no longer needed. 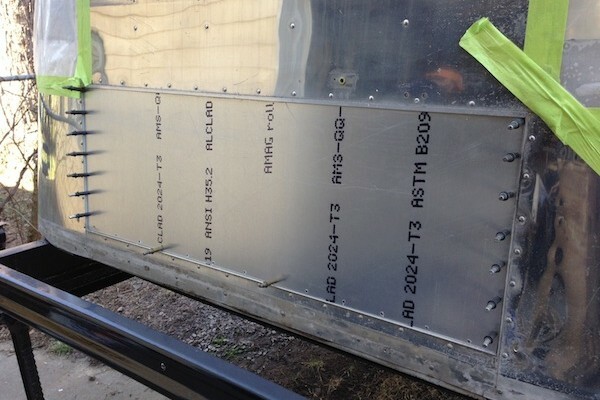 Time to learn to patch aluminum! With the help of Jason’s uncle, a former Air Force plane mechanic who also built his own airplane, we were well equipped with all the tools and training we needed to repair our “land plane.” After ordering some new sheets of aluminum and a few comical nights of sorting a bucket of various sized rivets in our chip ‘n’ dip bowl while watching tv, we were ready to get started. If you’ve ever riveted anything or are looking to, clecos are your best friend. These handy little guys tightly hold the sheets of aluminum together after you drill your holes for rivets, but before and during rivet installation. In our case, we were buck riveting, which requires access to the backside of the rivets to pneumatically hammer them against a steel block, called a bucking bar, that is held by a second person against the interior end of the rivet. Since our walls are removed, this is the only chance we have to make these repairs this way. 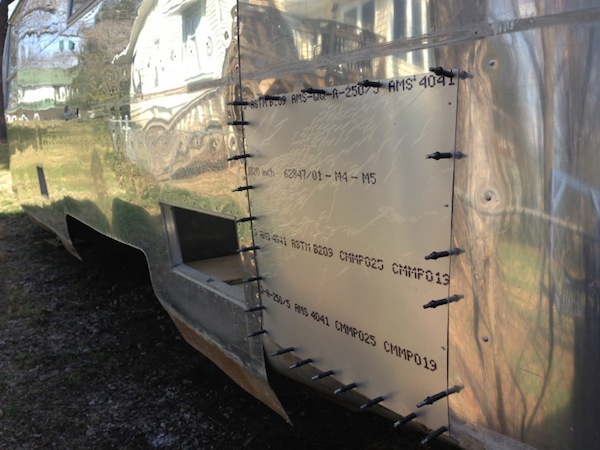 Buck rivets are the best method for structural metal repairs that also need to be waterproof. Riveting was actually rather fun, other than the noise and subsequent numbness of our hands and arms for a while after the hammering ceased. 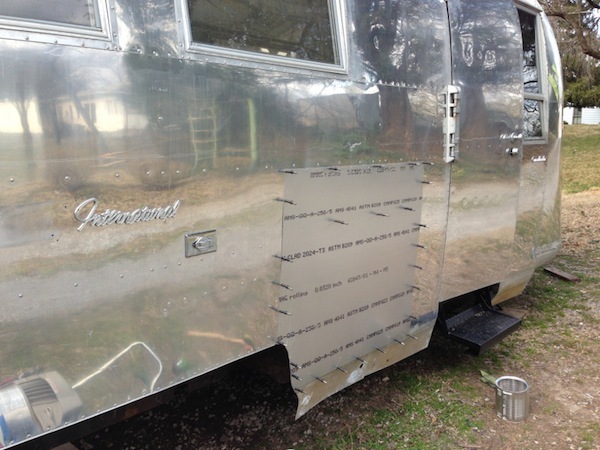 It was exciting to see a formerly jagged, ugly hole turn into a much more visually pleasing – and most importantly, waterproof – exterior trailer wall. 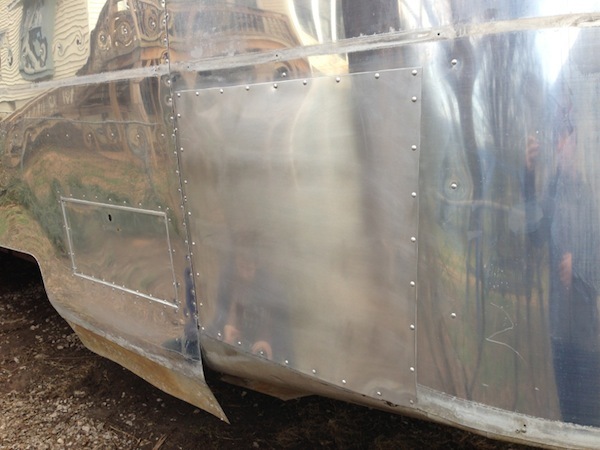 Now that she’s watertight, we’re ready to start on more reassembly from the inside out. 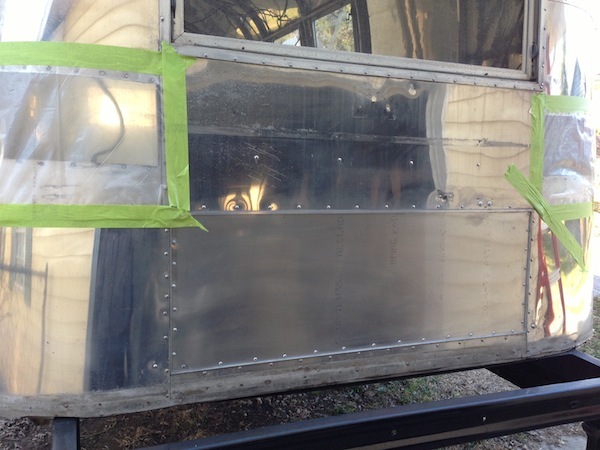 We can insulate the walls now that we don’t need access to the inside for riveting, add our new wiring followed by a second layer of insulation, then start reinstalling the aluminum interior walls. It’s so much fun to see the transformation now that the projects are smaller, less dependent on weather, and more easily accomplished!